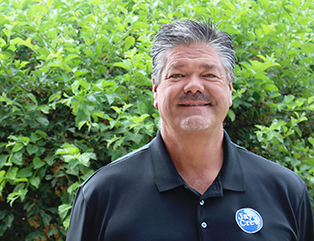 I’m Mark Davis and I am a Relationship Manager on the Jay-Crew sales team in Muncie. Although I was born and raised in Cincinnati, Ohio, I attended Ball State University and graduated with a Bachelor’s Degree in Natural Resources which helped me gain experience and understanding of landscape analysis and ecology. For over 30 years, I have been working in the commercial landscape industry. I spent nearly 20 years working for Brickman Group, working my way up from Branch Manager to Regional Manager to Vice President of over 5 locations. I enjoy using my knowledge in combination with my passion for landscaping to further Jay-Crew’s presence in the Muncie market. As a Relationship Manager, I get to work alongside my clients providing them with the resources they need to make an informed decision about enhancing the appearance and condition of their properties. Outside of work, my wife and I are busy raising our 6 children, ranging in ages from 12-26 years old. When there is time, I like to golf and go fishing. Our family is also actively involved at New Life Church.